A wildly inventive adaptation of Sir Arthur Conan Doyle’s classic mystery The Hound of the Baskervilles makes its West Coast premiere Thursday night at The Old Globe. 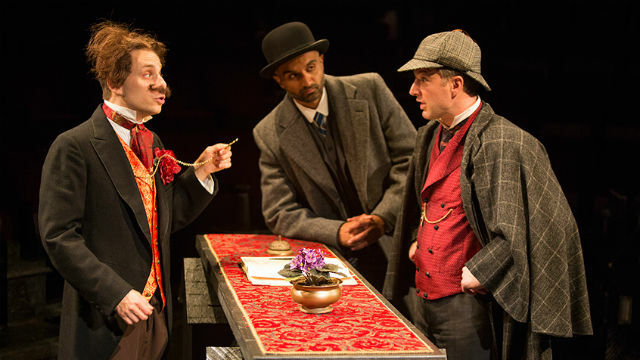 Ken Ludwig, one of America’s great comic playwrights, brings to life literature’s most famous detective — the inimitable Sherlock Holmes. In “Baskerville” five fearless actors conjure the world of Victorian England as Holmes and Watson take on one of the most diabolical cases of their career. “Ken Ludwig is an American master and one of the finest comic dramatists we have,” said Globe Artistic Director Barry Edelstein. “I am thrilled to bring his latest brilliant creation to San Diego. It doesn’t take a super detective to figure out that our audiences will embrace its hilarious high-style and spine-tingling suspense. The play runs through Sept. 6 at the Sheryl and Harvey White Theatre in the Conrad Prebys Theatre Center in Balboa Park. Tickets start at $29 and are available online at www.TheOldGlobe.org or by calling (619) 23-GLOBE.